This week seems kind of calm from the side of the programs. I’m not very fond of it but it’s probably because the last couple of weeks we saw many programs scamming. No, I don’t want to jinx it, but we always need to know that it can happen anytime with any program. It’s just a nature of this industry. In the meanwhile, we see some solid players on our monitor that have kept investors satisfied for a good a while. Today I’m presenting you a review of one of the latest rivals to DavidNews.com monitor. A HYIP called Avast Coin Limited joined the Golden Stage listing on our monitor 7 days ago and has been online in total for 21 days. On the 14th of March, it has status Paying. It’s a mid-term program offering 3% , 4% and 5% interest rate depending on the deposited amount. Now I have reinvested in this program $400 and will keep you updated about the payment status in the following days and weeks. Avast Coin Limited is offering 3 different mid-term investment plans with 3%, 4% and 5% interest rates. All three plans are available for the deposit term of 40 days. Minimum deposit is different for all plans - $50, $200 and $500 in the last investment plan. Initial deposit is included in the interest rate for all plans. We are talking about break-even point after 34 days for the first plan, 25 – second plan and 20 in the third plan. Basically, the real profit is generated after reaching this point. On the website, you can find a very convenient calculator to understand what’s the potential revenue benefit for each of these plans. Keep in mind that there are only two payment options in this program, which are Payeer and Bitcoin. Let’s get more into details about this program. The website is built using a licensed version of the Gold Coders script. I can’t recall a HYIP website with similar design or content. Of course, it’s hard to remember if the story of cryptocurrency trading and mining haven’t been read in the past when we see that writing a legend about cryptocurrency is a hot trend right now. Besides that, the website has a very light and attractive design. Moreover, it’s quite functional and has all major information located on the homepage of the website. 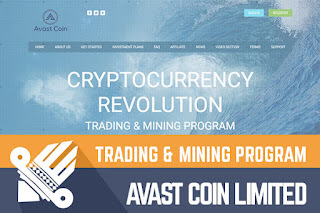 Feel free to do your own reading but the main idea is that Avast Coin Limited is positioning itself as a cryptocurrency mining and trading program, which has registered a UK company for this purpose. Sure, we all know it’s usually done with a purpose to create an image of the legit business. In the meanwhile, it takes extra effort for admin. The website has a valid SSL certificate assigned by COMODO, which expires September this year. DDOS protection is powered by Genius Guard. Domain names have been purchased in the September 2017. Sure, every business needs some time to prepare for the big launch. Avast Coin Limited has some presence in social media. Unfortunately, YouTube channel couldn’t be accessed with the link provided on the website. There is also a FB group and a Twitter account with 1000 followers. Is it worth following Avast Coin Limited? Feel free to check the twitter profile and decide. It looks unnatural with 18 tweets, comparably low engagement rate and two likes average for a tweet. The first post on twitter profile has been created on the 3rd of November 2017. Talking about the advertising, I did open the News page on the website and found external links pointing to several online resources where you can find the press release about Avast Coin Limited. I didn’t check all resources and you can make your own decisions about the credibility of each resource, but such approach is not something you see on the website of every HYIP. I was disappointed after opening the Videos page because there was the same video saying Coming Soon but embedded 5 times on the page. Probably, there will be different testimonials in the future. Like the website design and layout, investor panel is very convenient, and it was easy to navigate on it for the first time. Therefore, there shouldn’t be any problems for both beginners and professionals. Even though all admins want us to make a deposit in their programs, some of them build such inconvenient investor panels. The minimum withdrawal limit from Avast Coin Limited is $10. Admin says that withdrawal can require from 1 to 24 hours. Every time I requested Bitcoin withdrawal of less than $20 the processing time was up to 3 days but for withdrawals $20 or higher instant. Processing times are related to Bitcoin processing time. Moreover, no matter if you add your funds through Payeer, withdrawals are paid only to Bitcoin wallet. Drop a message if you have any other experience with withdrawal times. I assume that the most popular plan might be the plan offering 3% daily due to its minimum deposit requirements. However, I will do the calculation for the deposit of $200; it's more beneficial with its 4% interest rate. After 25 days my deposit would reach the break-even point and last 15 days of the deposit term it would be generating net revenue. In case the program wouldn’t collapse within 40 days-time the net revenue would be $120, which is 30% net revenue within 40 days. We are currently looking at the mid-term program, which has a neat and functional website, the standard legend of the cryptocurrency trading and not much information about it online. Yes, for the 21-day old program I would expect more conversations on forums and information available online. According to data from Alexa rank, 32.5% of Avast Coin Limited visitors are from Australia. Most likely there is not enough data collected to provide more information, but we can perceive it as a hint. Now I don’t have much to add to this program and today it looks fine. Sure, we don’t know what will happen with this or any other HYIP overnight or over the weekend. Therefore, if you ever decide to make any investments, don’t invest more than you can afford to lose! Have you already made an investment in Avast Coin Limited and have any useful information to share with us? Please drop a message in the chat box to share your experience! Join Avast Coin Limited Here!